It's been a week of mixed fortunes in my little crafting world. I went to a craft fair, and the good news is I got lots of new stash, some of it at bargain prices. The bad news is, I managed to lose one of my bags containing a Tim Holtz set (which I'd paid full price for, to do a workshop at my craft club). Then the other day, I was playing with my new Tim Holtz dies and managed to break my Cuttlebug. (Yes, I know they're not recommended to go through a Cuttlebug, but I've never had any problem before with them). I may have been asking it too much, the shim might just have been too thick, and next thing, the side exploded off. I managed to fit it all together but the bad news is, it keeps popping off as soon as anything goes through the rollers. So the good news is, I'm upgrading (sizewise at least) to a Big Shot, which I never had room for before. And the happy news is, I've got a new stamp set coming out, PartyGirl, which will be available very soon, in time for STAMPlorations' birthday party - watch this space! The PartyGirl set is designed so that you can create a party girl front view or rear view, or you can use the dress separately with or without the hanger. I doodled a rack for my dresses to hang on. The sentiment is from another set by Shery that's being released for the birthday party. The sparkly stuff is Crushed Ice Crystals. I'm entering this into Virginia's View, Ombré /Monochromatic. 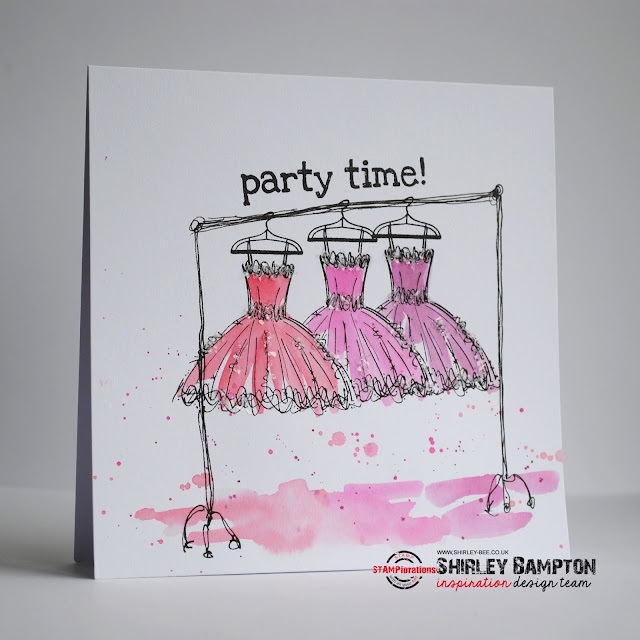 ETA: I'm also entering this into Pretty Pink Posh Watercolour Blog Hop. Oooh-la-la! I'm totally diggin' those party dresses! Sorry to hear about losing one of your goodie bags (ouch!) and your Cuttlebug, Shirley. Like you, I use Sizzix dies on them and fortunately, I haven't had any problems. Yay for the upgrade! OMG Shirley....I have never heard quite a story like yours to get a "Brand New Big Shot!!!" You will LOVE it! I upgraded from a Cuddlebug to a Big Shot when the Big Shot 1st came out about 7 years ago and have never had a problem with it. I love my big shot - sure you will enjoy your brand new one! Too bad no one turned in your bag of goodies. Love your hangers and those very pretty party dresses. Party Girl sounds like she will be a big hit with all the extra stamps. Oh wow!!! I love these dresses!!!! So pretty! You will love the Big Shot!! Sorry that you lost your package! Bummer! Bad news, indeed :((((( - buy a Big Shot..... great card - those dresses are simply gorgeous! I had a cuttlebug for years. Then I had a grand calibur and a cross-over - but kept going back to cuttlebug. Now I have a big shot and will never change again! Love this pretty dress - -perfect for so many occasions! Major bummer(s) but you're gonna love the Big Shot, so thank Tim. Groovy prom dresses! Really great party invitation! Love the dresses. Absolutely darling!!!! 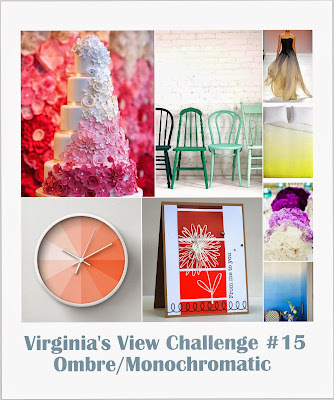 So glad that you join the fun over Virginia’s View “Ombre/Monochromatic” Challenge! That's soo pretty, I love it! Shirley this is absolutely gorgeous!!! I will be watching for it! In the meantime, give me your opinion on the Big Shot versus your Cuttle Bug when you've time.